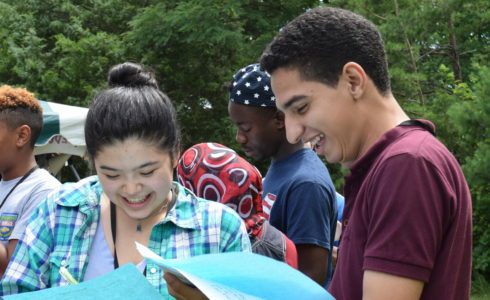 Youth at the Global Youth Village, international summer program for youth, learn critical peacebuilding and dialogue skills. Legacy International offers training experiences that foster inter-ethnic, racial, and religious understanding among youths and young adults facing troubled circumstances – in the U.S. or abroad. Developed and tested over three decades, LivingSidebySide® features complete manuals for facilitators, worksheets for participants, and custom training and certification services. The program has been implemented with mixed populations in the U.S., and with Israelis and Palestinians, Northern Irish Protestants and Catholics, various Nigerian groups, and Croats, Muslims, and Serbs from Bosnia and Herzegovina. This curriculum is featured prominently at the Global Youth Village. Participants gain the skills and shift in perspectives needed to begin to break cycles of intolerance and violence and transition from a culture of conflict to a culture of participation, with respect for rule of law.